This is already making the rounds and likely to be everywhere soon, but it’s just too fun not to post about, especially since we do like a unique bridge. 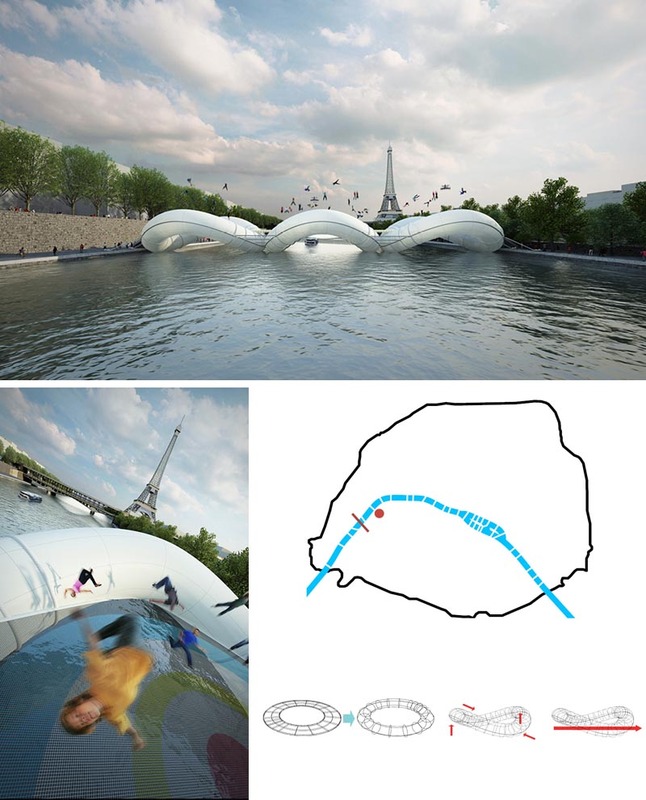 Paris-based architecture firm Atelier Zündel Cristea (AZC) proposed the above bridge in response to a competition brief for A Bridge in Paris. 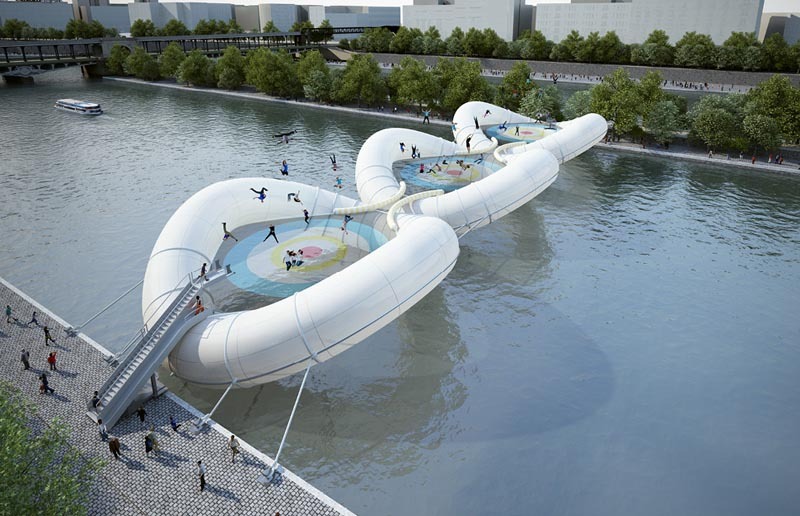 With enough bridges already in existence over the river Seine to facilitate the flow of both vehicular and pedestrian traffic, AZC thought it would be fun to offer a more playful way to get from La Rive Gauche to La Rive Droite and vice versa: an inflatable bridge equipped with giant trampolines, allowing visitors to bounce across the river. 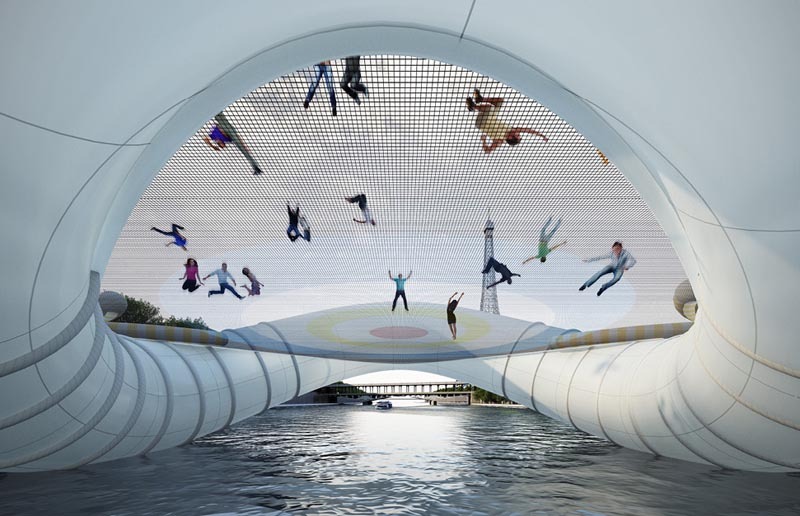 Each section measures 30 meters in diameter with a trampoline mesh stretched in the center. Held together by cord and inflated with air, the bridge forms three subtle arches. Though AZC’s design received third prize in the competition, I have a feeling that it will become a reality via someone, somewhere, even if only as a temporary structure. It’s just too great not to. This entry was posted in Architecture, Fun, Just Plain Cool, Street Art, Stuff We Like. Bookmark the permalink.